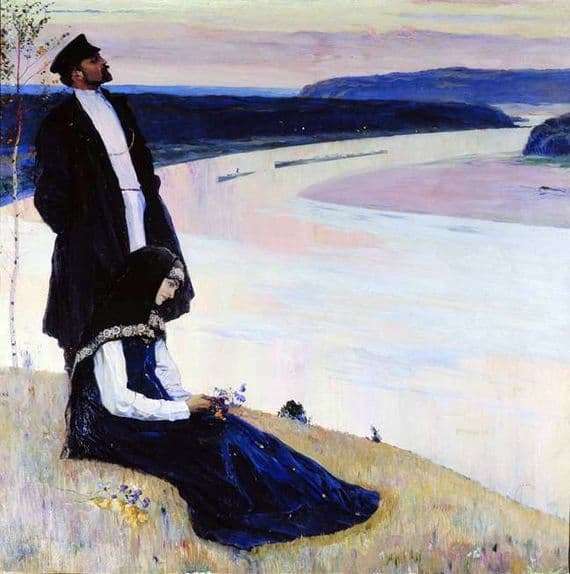 The history of the famous painting “Over the Volga” by the artist Nesterov is very interesting. The magnificent canvas created in 1905 was acquired by a collector from Astrakhan P. M. Dogadin. After that, the work of art was exhibited in St. Petersburg, in Moscow, in Astrakhan, as well as in museums of China. Mikhail Nesterov as an artist was formed under the influence of such eminent artists as Alexey Savrasov and Vasily Perov. Consequently, being a diligent student, in the painting “Over the Volga,” the master of painting shows changes in the genre theme of the artist, when a particular role is assigned to the landscape. Social themes that characterized the paintings of the XIX century, gradually fade into the background. All tasks to identify hidden emotions are assigned only to the landscape, it is he who causes mood swings. A similar image of nature allowed the author to abandon the detail. Only the general content of what he wanted to tell is retained. There is no plot in the film. Our gaze immediately opens from the highest bank of the Volga River. The whole composition is built on the brightly marked parallelism of figures and landscape details. Thus, the self-confident male silhouette that rises above the expanse corresponds to the active bend of the coast visible in the distance and the striving painting of the caravan of steamers. The graceful figure of a young lady is a thin birch on a high bank that has just been covered with delicate leaves. A man looks at the Volga expanses with indifference, he loves only himself, and in the eyes of a woman – melancholy, sadness froze on his lips, and even a small bunch of flowers in his hands seemed to stop. Nesterov with a brush very accurately conveyed the mood of the people. A low-profile landscape, very stingy, only emphasizes the state of human souls.